Natural soothing oil especially formulated for menstruating women. 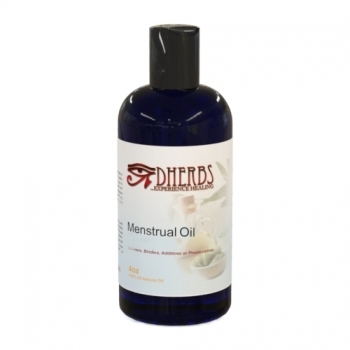 Dherbs Menstrual Oil is an all-natural product consisting of combination of carriers and essential oils, which are specifically selected to soothe your way through those difficult days that can come up especially during that time of the month. 4 OZ FL. Rub a moderate amount of oil into abdominal region and massage into skin in a circular motion. Oil can also be warmed up. Begin using 2-3 days before menses and use during menses or use as needed. Form external use only.